This green tomato curry recipe is easy to make. Green tomatoes cook fast so making curry doesn't take a long time. You can make this tomato curry in about 10 minutes. 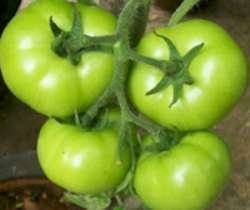 This green tomato curry recipe as given below is my mother's recipe. You can find a few variations that I tried in the tips section below. Heat a kadai and add vegetable oil to it. When they stop spluttering, add curry leaves, turmeric powder and chopped green tomatoes. Mix and cover. Cook on low flame for 2 minutes. Add gud/jaggery, salt, red chili powder, a little water. Add the roasted and powdered til / sesame seeds. The green raw tomato curry is ready to serve. It can be served hot or at room temperature with plain rice, chapati, and poori. This will keep in the fridge for 2 days. For variation, you may add chopped onion. Add it as soon as the mustard and cumin seeds stop spluttering. Fry till onions are transparent and then add the chopped green tomatoes. You may add chopped ginger or ginger paste. Instead of or along with roasted sesame seed powder, add roasted and powdered ground nuts (peanuts). That tastes great too.